May brought on some fleeting sunshiny days and a whole load more rain! However we did manage to achieve a lot of tasks and got very at one with the mud! 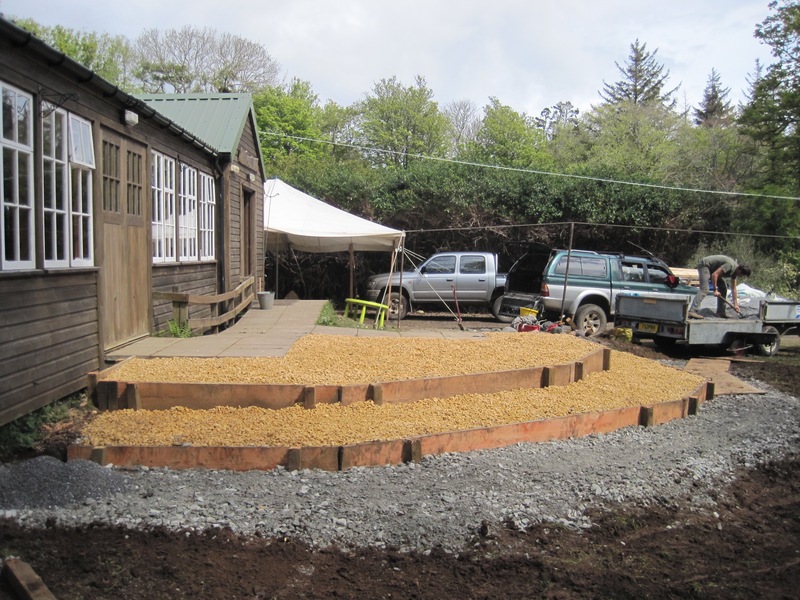 The main task for May was to build steps into a slope outside the community hall. 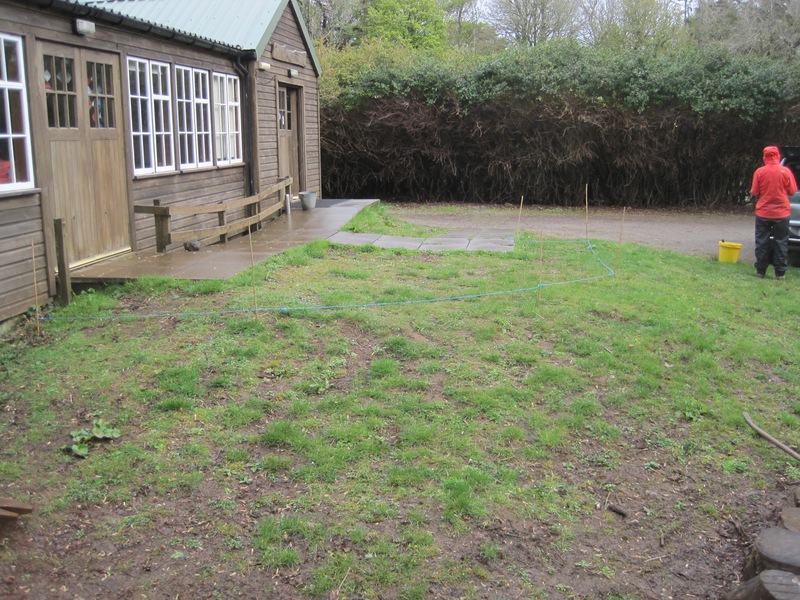 There is a fire pit of which at events a fire is lit and throughout the night what is seen in the first picture as a grassy slope, this small hillside outside the hall becomes a lethal mud slide once fifty or more folk start walking up and down it. Large steps seemed to be the best option so with a fair bit of measuring and head scratching a plan was hatched and a starting line could be marked out. There was a fair few hiccups and delays along the way and a deadline of an island wedding at the end of the month which kept it all exciting and slightly stressful factors along the way. The hall had also been hired by Right Lines Productions for two weeks of rehearsals of Rapid Departure which involved getting their songs stuck in our head and the inclusion of some funny characters appearing in amongst our mud, see if you can spot one in the pictures below! Nonetheless with the determined efforts, full devotion to the project and slight hysteria at times (!) 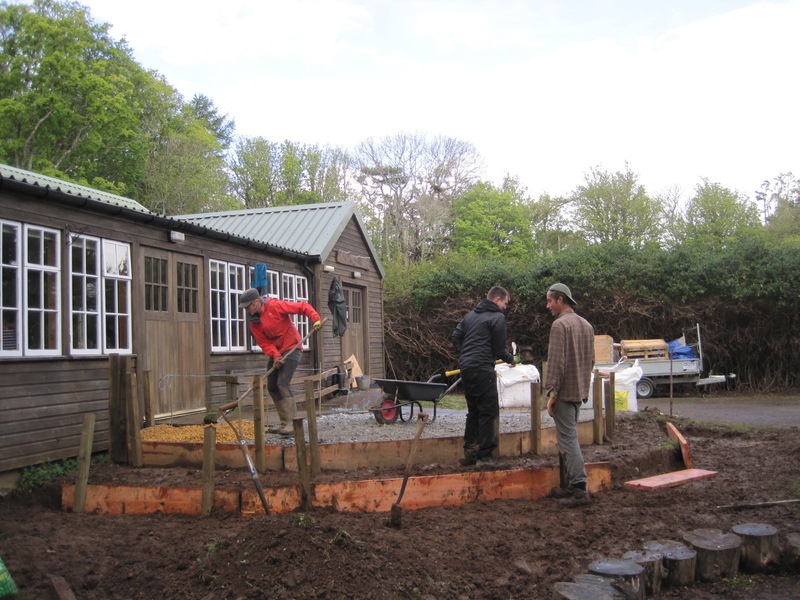 the volunteers gave 150% and the finest steps were built, all in time for the wedding, just! 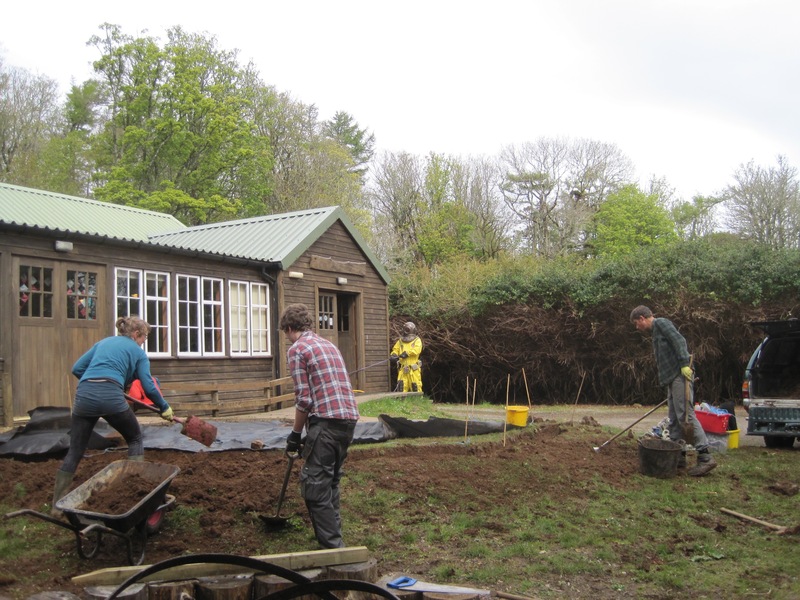 Digging has begun… but what is that by the hall in yellow!?! 1st step dug and a whole load of mud! Starting to take shape though. 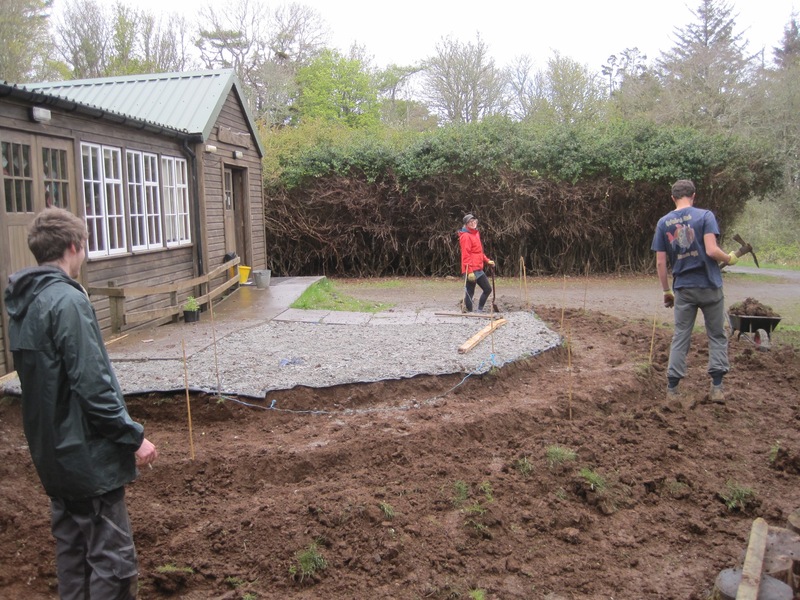 Large stones preventing progress…the only way was to dig them out! 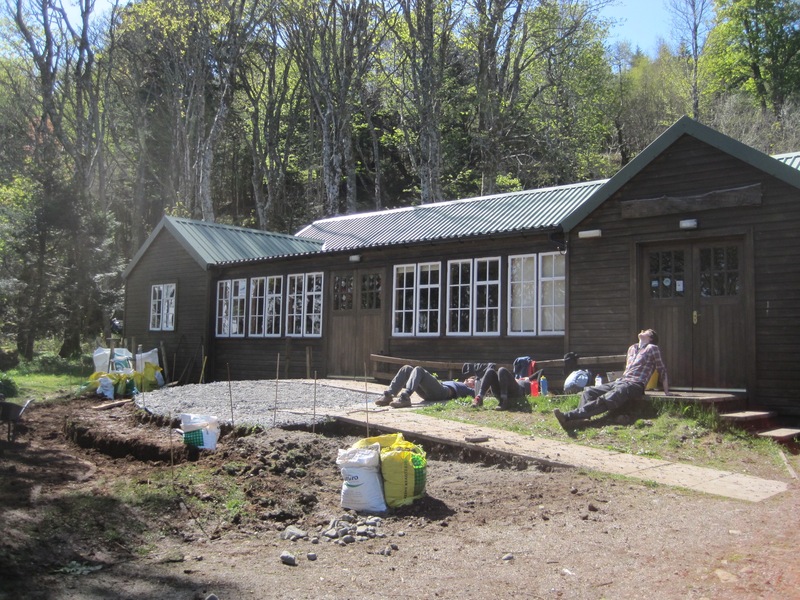 A WELL needed rest after a serious amount of digging, removing rocks/boulders (!) 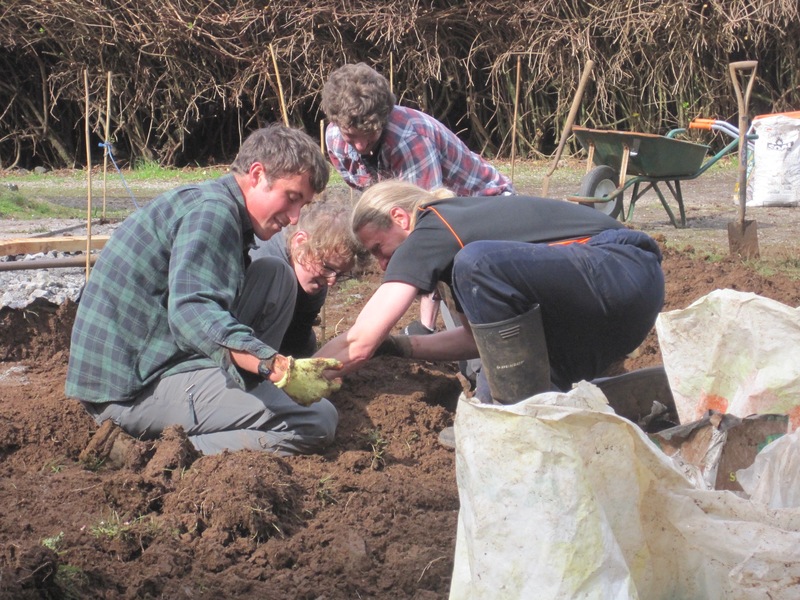 and shifting the excess soil and maybe a mild panic that I had pushed volunteers a bit to hard and no more work would take place! 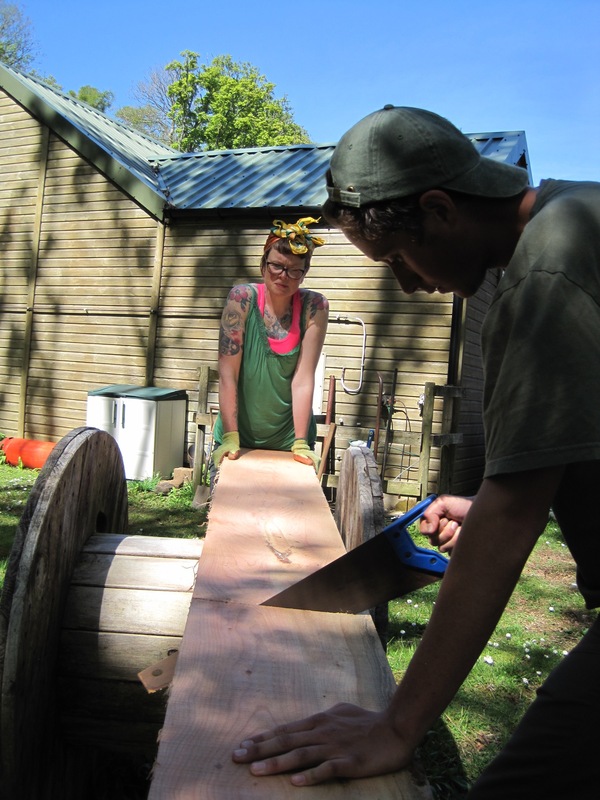 The long awaited planks of wood arrived, cut by Bob and his woodmizer on Eigg from a windblown Douglas Fir and with a fair bit of sweat, was cut by hand to size! 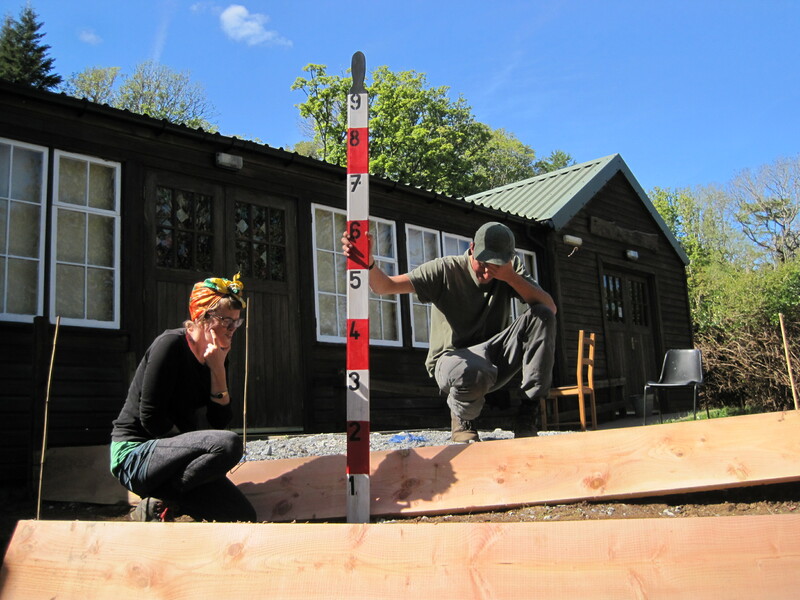 This was after a mathematical nightmare, a lot of measuring, checking again, marking out the steps once again, and then maybe again to be ABSOLUTELY sure before the first piece was cut as we only had the exact amount of planks with not a millimetre to spare! Back to rain and squelchy mud! Fence posts were banged in to keep the wooden steps in place. 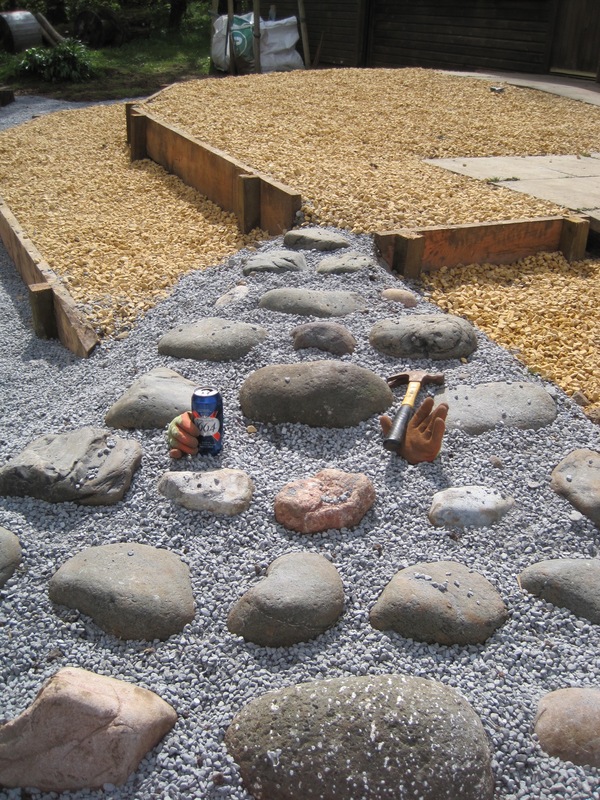 A few more stones had to be removed…. Delivery of the long, long, lost then found again, looong, awaited for gravel ! Only to find when we opened the bags it was bright orange and reminded me of cheesy wotsits!! By this point the wedding decor just had to fit in with the new cheesy wotsit theme! You will be glad to know that after a few larger events and a bunch more rain it has started to dull down…a bit! 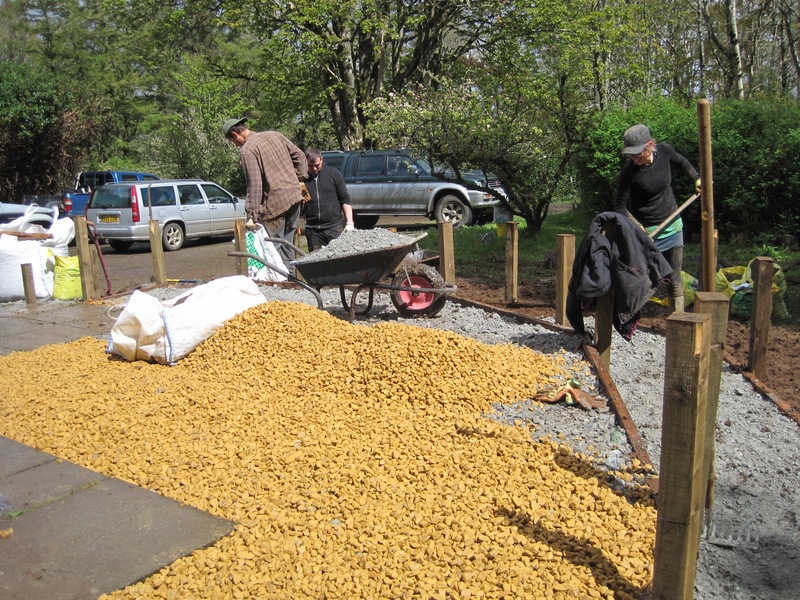 We then had to go and source some gravel already on the island as we didn’t have enough cheesy wotsit gravel! We were up to Wednesday by this point and the wedding was on Saturday, talk about cutting it fine! Hysteria had set in, the ‘Eigg measure’ was being used (water level prop from the play) to try and figure out step depth and levels…. 2 Eiggs worth for each step! 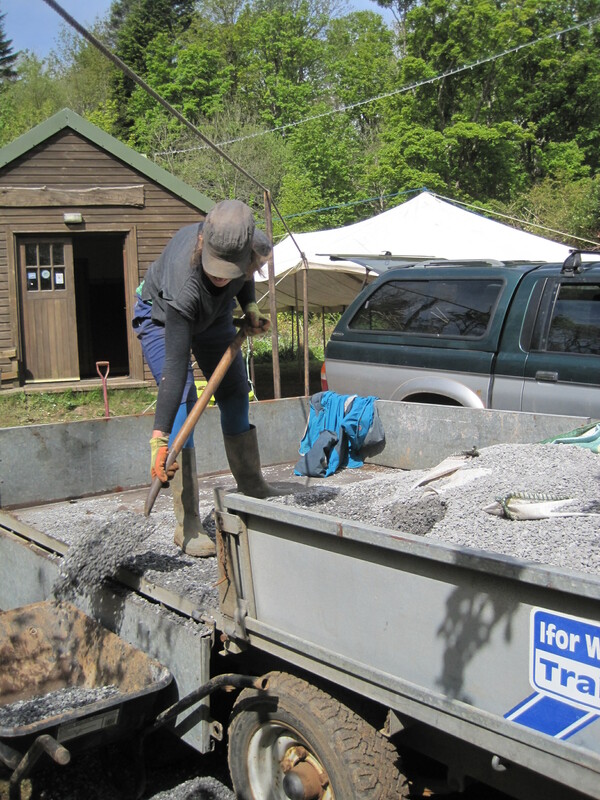 Back to serious stuff…Some ‘normal’ coloured gravel we managed to beg and borrow on the island but did mean hand shovelling it onto the trailer and then back off at the other side. More back breaking work! An arty farty triangle and I think we may have a missing volunteer, anyone seen them!?! 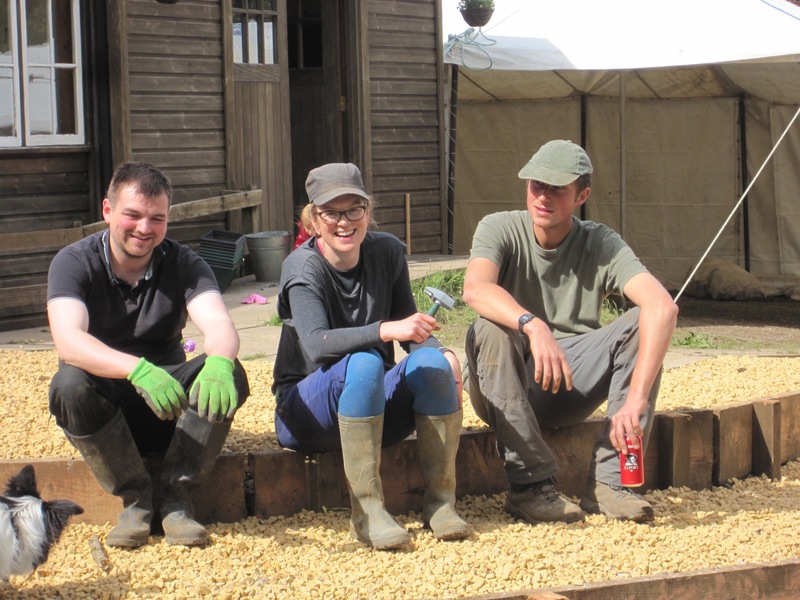 One mighty team of volunteers, L to R – Jake, Maddie and Andrew!! Not forgetting to mention Ed who started the project but was gutted to have to leave and miss the completion party! 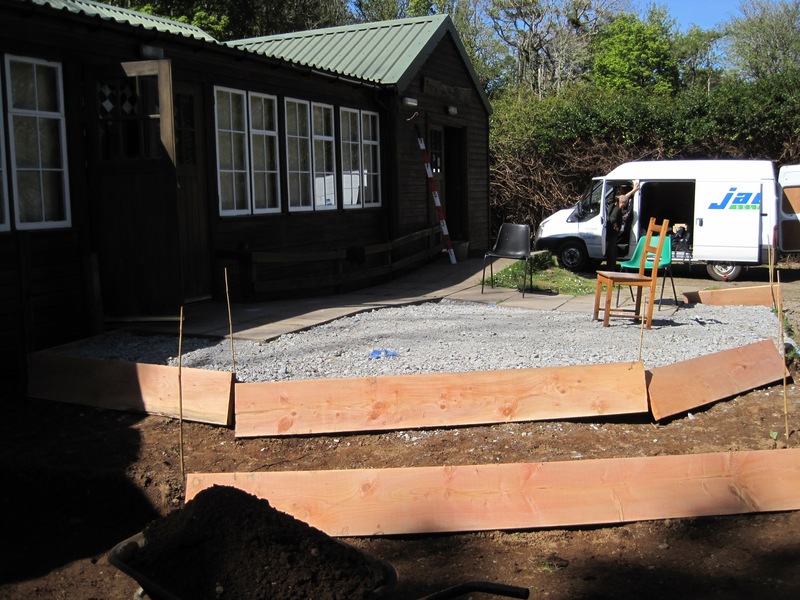 And look, the steps double up as seats just as well we measured it to the two Eigg’s worth!